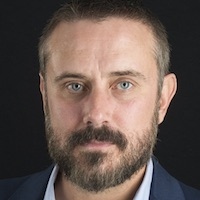 Jeremy Scahill is a cofounding editor and senior investigative reporter at the investigative news site The Intercept, where he also hosts a weekly news podcast, Intercepted. Scahill is the author of the best-selling Blackwater: The Rise of the World's Most Powerful Mercenary Army (2008) and Dirty Wars: The World Is a Battlefield (2013). He is a writer, with David Riker, and a producer of the documentary feature film Dirty Wars (2013), which was nominated for an Academy Award. In 2010 he won the Izzy Award for independent media, and in 2013 he won the Windham-Campbell Literature Prize. His investigative journalism career began at Democracy Now!, and by the early days of the Iraq War in 2003, he was filing groundbreaking reports from Iraq, including from Abu Ghraib prison. "Dirty Wars" article in "The Guardian"
Scahill and Greenwald on Democracy Now!